This Tuscan-Style Grilled Rib Eye Steak marinated in fresh rosemary, garlic, balsamic vinegar and olive oil is so tender, it will melt in your mouth. 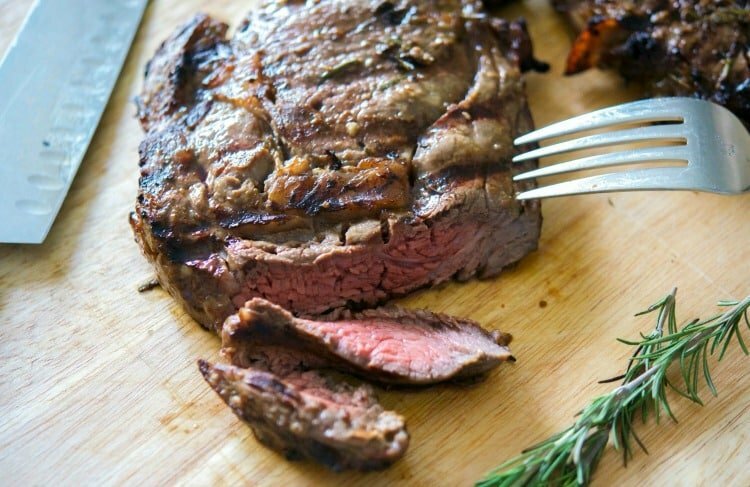 Grilling season is finally here so one of the first things I did when I broke out my grill was to make this Tuscan-Style Grilled Rib Eye Steak. 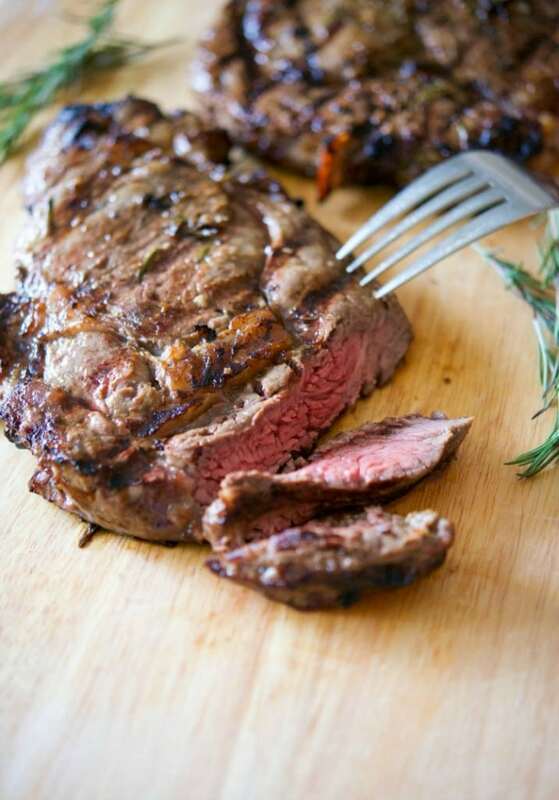 Rib eye steak is my family’s ‘go-to’ cut of beef when it comes to grilling season. Sure, a filet is nice, but I really love the marbling in the rib eye cut; which helps keep the meat tender and juicy. I generally just sprinkle with a little Kosher or Sea salt and fresh cracked black pepper, but I wanted to give you guys a new beef recipe since it’s been a while. On that note, I also wanted to make it as simple as possible and you can’t get much easier than this recipe. Combine fresh chopped rosemary and garlic; then whisk in balsamic vinegar, extra virgin olive oil and the salt and pepper. Add your steaks to a resealable plastic bag; then pour in the marinade. Allow to sit in the refrigerator for at least 2 hours or overnight; then grill to your liking. Simple right? 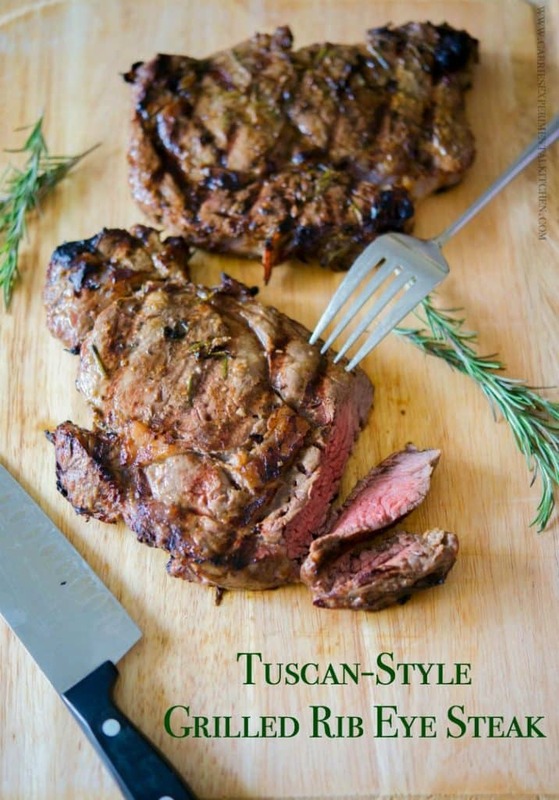 This Tuscan-Style Grilled Rib Eye Steak was incredibly flavorful; not to mention tender. Two rib eye steaks are plenty for the three of us, with enough leftover to top our lunchtime salads or make a rib eye steak sandwich. 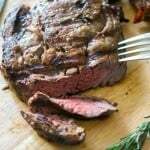 I served our steaks with Green Beans with Tomato & Garlic and Balsamic Rosemary Roasted Potatoes and my family LOVED it. I hope yours will too. ~Enjoy! Add the rosemary, garlic, oil, vinegar, salt and pepper to a small bowl and whisk together. Add the steaks to a resealable plastic bag; then add the marinade mixture. Seal the bag and coat the beef. Refrigerate for at least 2 hours or overnight; then grill to your liking. I made two quadrupled batches of this for a BBQ – this recipe is a winner. Thank you. Awesome! I’m so glad you enjoyed the recipe, it’s one of my favorites as well. Carrie, I made the Tuscan-Style grilled rib-eye steaks. The steaks I bought we’re 20ounce rib-eyes. Too big! I doubled the recipe they were so big. I will make this again, but tweak it a little. #1 16ounce steaks are just fine #2 marinate overnight. This recipe was fabulous. Looking forward to making it again! Wow yes 20oz are pretty big and this recipe can be doubled/tripled if need be. We like to make extra so that I can leave it sliced in the refrigerator to top salads during the week too. I’m glad you enjoyed the recipe Lisa! I love tuscan cuisine! Thank you for recipe I will try it! If you scroll down to the recipe card, click on the PRINT button under the image. I just tried it on my computer to make sure it worked. Enjoy the recipe!